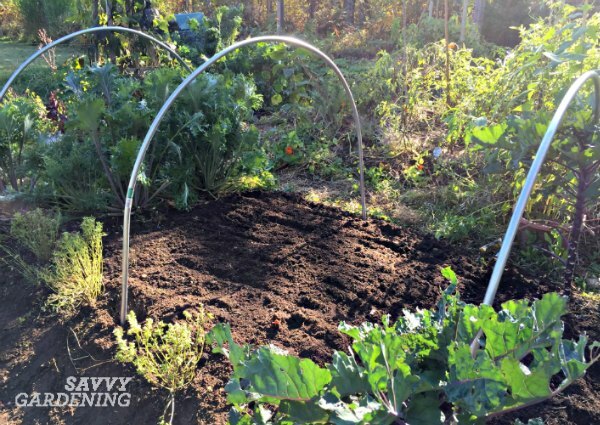 For years, I’ve relied on my PVC mini hoop tunnels to shelter the crops in my winter garden. Typically, my beds are filled with hardy veggies like kale, tatsoi, spinach, mizuna, and leeks. The PVC hoops have worked well, but after last winter’s snowmageddon, when my garden had more than 8-feet of snow, I worried that the plastic hoops would flatten like pancakes. Amazingly, most came through unscathed, but it reminded me that I should continue to test and trial other types of structures to make sure that my winter garden has the best possible protection. 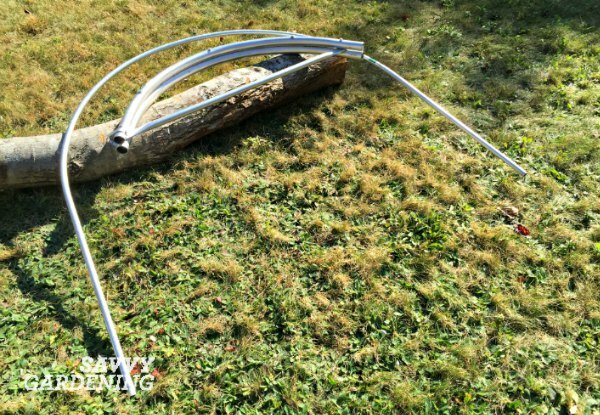 Therefore, I spent the weekend making metal hoops using my new Johnny’s Quick Hoops™ Bender. There are different types of Quick Hoops Benders, but this one makes hoops for 4 foot wide by 4 foot tall low tunnels. This fits my 4 by 10 foot beds perfectly and allows ample room to shelter mature kale, collards, leeks, and other tall crops. The bender comes with a lever bar and lag screws for securing the bender to a solid surface like a picnic table, work bench, or in my case, a heavy log. It may not have been ideal, but it worked like a charm. Bending the 1/2 inch EMT conduit in my Quick Hoops Bender. 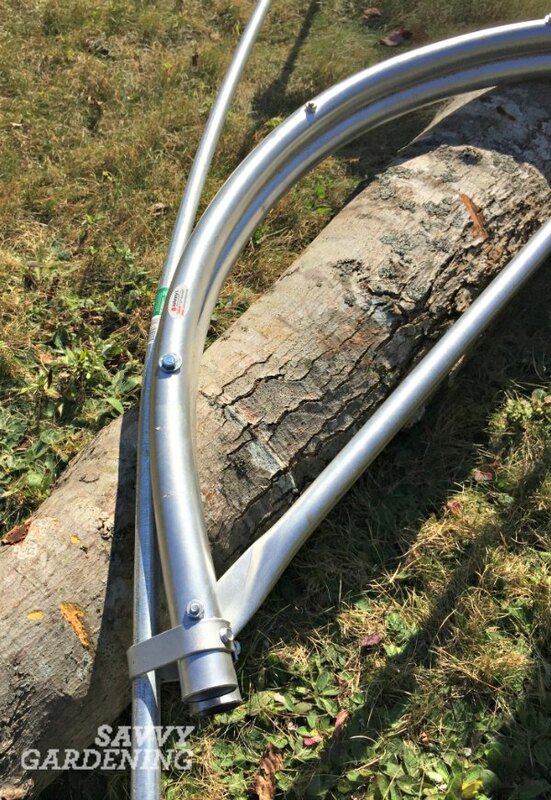 To make the hoops, I needed 10 foot lengths of 1/2 inch diameter galvanized electrical conduit (EMT), which was easily sourced at my local hardware store for $4.00 each. According to the instruction manual, I could also use 3/4 inch or 1 inch diameter conduit if I wanted stronger hoops for the ends of the tunnels. However, where my tunnels are only 10 feet long, I didn’t bother, and stuck to the 1/2 inch conduit. The instruction manual is more of a pamphlet – but wonderfully illustrated with photos that explain each step. Perfect for non-handy gardeners like me. It promised that the hoops would be very quick to make – about one minute each, and after making the first one (and checking and re-checking with the instructions several times), I was able to make five more in mere minutes! (Side note – It’s really fun to bend metal). The first hoop was quick and easy to make. I immediately took three of my new hoops up to the garden and placed them over a bed I had just seeded with cold tolerant salad greens. The late germinating plants will overwinter and give me a homegrown harvest of arugula, mizuna, and baby kale for March harvesting. For now, I will cover the hoops with a medium weight row cover, but once the temperatures drop in late autumn I will replace that with a length of greenhouse plastic. The finished quick hoops ready to be covered with greenhouse plastic. Do you extend your season? What is your favourite structure for the winter garden? NICE! Will you be running another length of metal across the top to secure the hoops together (prevent racking)? Or will the greenhouse plastic hold it all in place? And last but not least will you secure the plastic to the metal hoops? Cheers Glynis … P.S. Tomatoes grew like weeds this year and apparently didn’t read their packaging as to being medium sized. Compost, mulch and perfect weather. They won’t overwinter but their seeds will pop-up early in the road covers. Read your post for first time, but will definitely be following, and buying book. I, too, have been using both pvc and 1/2 in conduit for tunnels, though not doing multi-seasonal planting/ harvesting as you do. I’m wondering how you attach the bottoms to the raised-bed frame? Also, whether there are preformed fittings to attach the top support? I have used wire, but it’s somewhat messy. At the bottoms I have used iron rebar spikes driven into the ground, and slipped the conduit over protruding portion, and alternatively, perforated galvanized pipe hanger screwed to the wooden frame. Keep up the great work to motivate those of us, like me, who tend to slump in the winter.